Ford 2, Davis 1, Wilkinson 1. An opportunity to retain top spot on the ladder was all that was needed for the boys to put paid to Aspley on Saturday. Kicking into the wind in the first quarter, Clements scored a goal at the one-minute mark and this set the tone for a dominant quarter. We had all the play and should have been five goals up at the 15-minute mark, but very inaccurate kicking meant the lead was only 19-points at the break. With the aid of the breeze in the second, the game was put out of Aspley’s reach. 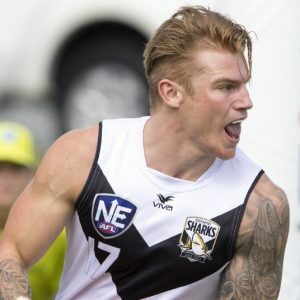 Hancock and Wilkinson both kicked goals off the ground and when Hancock goaled from the boundary at the 16-minute mark, the lead had blown out to 42-points. Aspley managed their only first half goal two-minutes later but the lead was 45-points at half time. The third quarter finally saw some straight kicking when Johnson and Hancock again haunted Aspley and the lead was 43-points at the final change. The lead was only extended by 8-points in the last quarter, but our ability to restrict the opposition scoring was again outstanding. Sharks 36-shots to 14 was impressive, but the pressure put on Aspley, led by Charlie Ford, was the difference. We now head to Henson Park in Sydney for a top of the table clash with Sydney University. This is clearly our biggest challenge so far this season but confidence is high and I’m sure we are capable of causing another upset.